THE CHALLENGE? making an outsider an insider. Despite sterling reputations in their hometown of Chicago, Magellan Development Group, LLC and RAS Development, LLC faced a daunting challenge when they set their sights on winning a contract to serve as Master Developer for Somerville’s Union Square. Magellan and RAS were keen to establish a foothold in Massachusetts, but they had no local ties. They needed to learn about the community and the community needed to learn about them - fast. Magellan and RAS formed Union Square Associates (US2), replied to Somerville’s RFP and barely advanced beyond the initial selection round. They finished fourth out of four teams chosen to move forward. Although US2 had assembled a strong team, without a radical change in strategy; there was little chance that they would win the bid. That’s when they called in Novus. THE SOLUTION? An Innovative Grassroots Campaign. Novus immediately crafted an aggressive grassroots strategy to open up lines of communication between US2 and local business owners, elected officials and neighbors. The outreach generated crucial community support and helped US2 put together a final proposal that was sensitive to the needs of the community and demonstrated US2’s ability to win local support for the project. • Conducted polling to get a snapshot of local public opinion. • Led US2 teams on business walks that introduced US2’s principals, engineers and architects to Union Square stakeholders. • Hosted meet-and-greets with US2 representatives at popular local restaurants. • Mailed brochures and questionnaires to residents and businesses asking for input and feedback on US2’s approach. 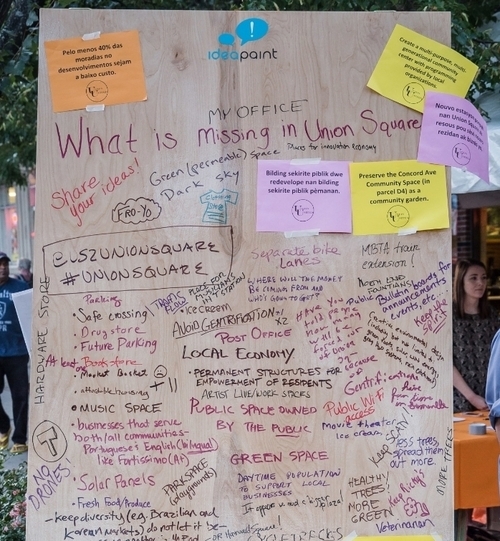 • Filmed on-street interviews with Union Square residents, business owners and US2 principals to gather input and demonstrate commitment to the community. • Activated local supporters through social media to email, write and call decision-makers on behalf of US2. Novus tracked and marshaled that support through its proprietary constituent relations management (CRM) software. US2 was selected as the City of Somerville's Master Development Partner for Union Square.